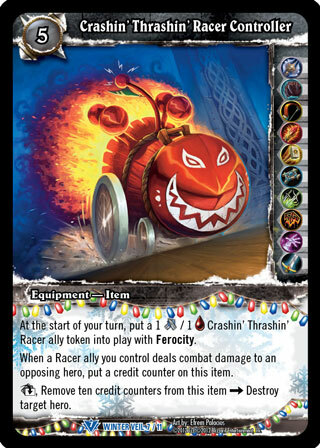 Rules: At the start of your turn, put a 1 [MELEE] / 1 [HEALTH] Crashin' Thrashin' Racer ally token into play with Ferocity. When a Racer ally you control deals combat damage to an opposing hero, put a credit counter on this item. [ACT], Remove ten credit counters from this item >>> Destroy target hero.